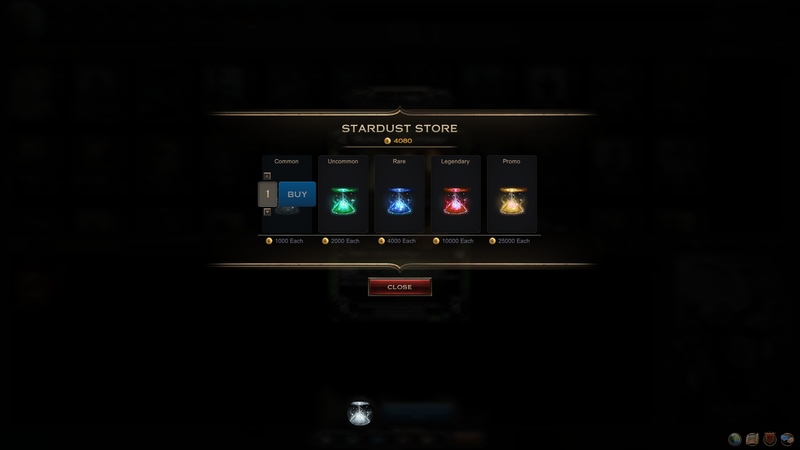 Buttons on Top (left to right): Store, Auction House, Siege (green = active red = defeated) Inventory Stash, Collection, Settings (including help). Buttons on Bottom (left to right): Account Level (click to claim rewards on level up) Chat, Whisper(Private messages), Mail. Random opponent challenge is located inside Tournaments, Constructed Ladder (See #T) has no cost but still has some prizes when you hit certain ladder ranks (refreshing at the end of every even numbered month). 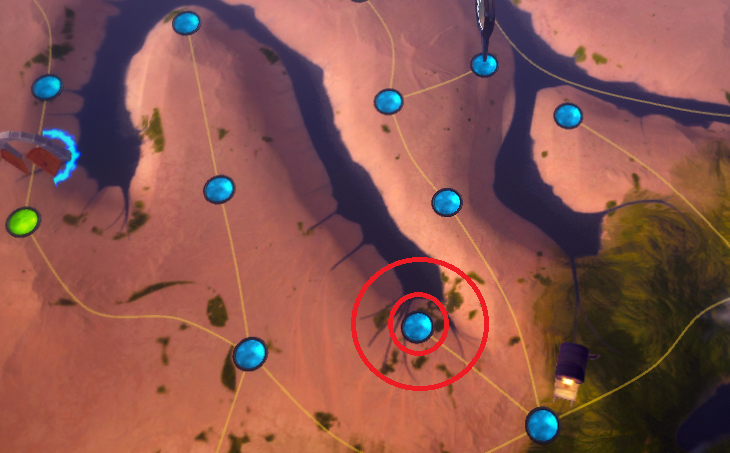 The rest is pretty self explanatory, with campaign and frost ring arena being PvE. 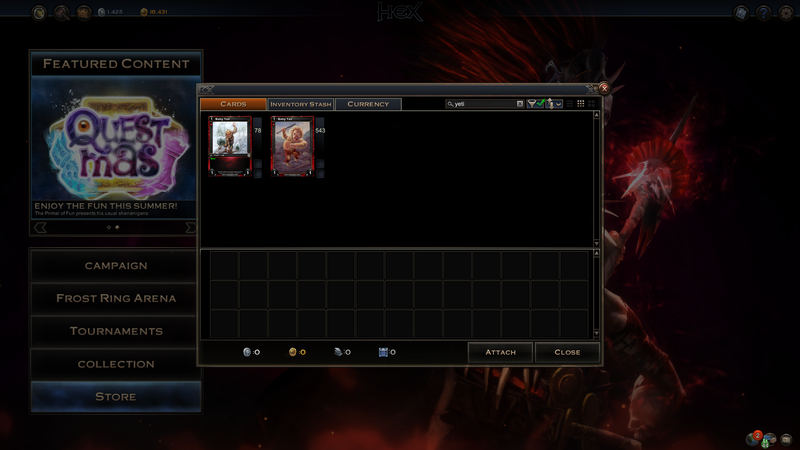 You start with 200 Starter Cards and 200 Basic Shards of each type. Making a deck doesn't tie the cards to just that deck, you can use them in multiple. 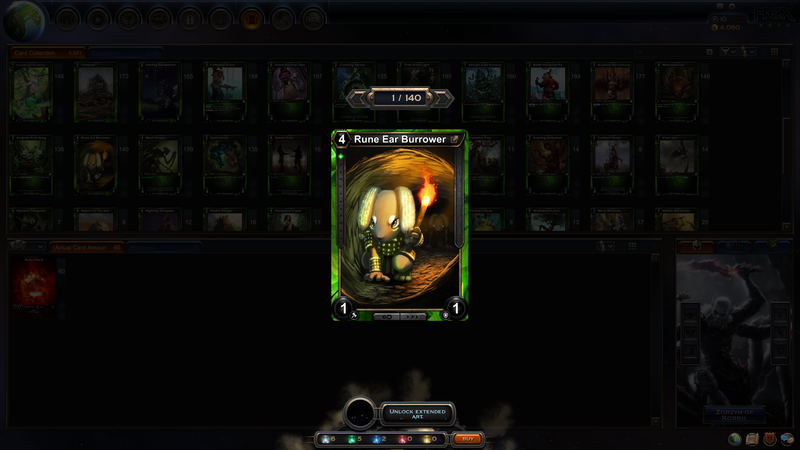 Please note: These starter cards are account-bound and therefore untradeable. #1 Void/out of play - left click to show cards stuck here. #2 Deck count, with the Beta sleeve showing (right click sleeves to see where they come from). If this goes down to 0 and you need to draw, you lose. #3 Your Constants go here - this is just a different card type. #4 Priority skip button: Click this to pass priority, or hit spacebar. 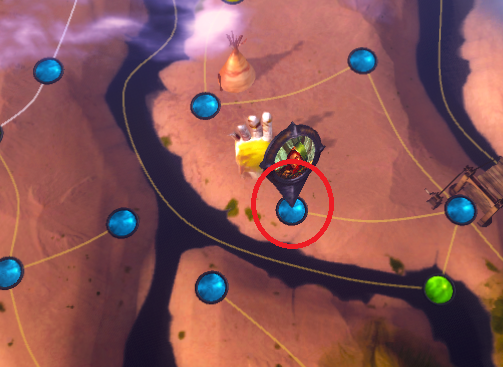 #5 Threshold/Resource count - Here I have 1 ruby threshold, which is notably seperate from resource count. I have X/Y resources (resources usable this turn/resources usable next turn (in this case X is 0 and Y is 1) - see the terminology section for more. #7 Champion Portrait - If your health goes to 0, you lose. On the left is the Ardent/Underworld symbol - (doesn't have much in-game effect). Below, the 1/1 you see is a status effect that you can hover over to see what it does. #8 Equipment slots - Only used in PvE, shows effects you’ll have on your cards. Click the arrow to show the slots. 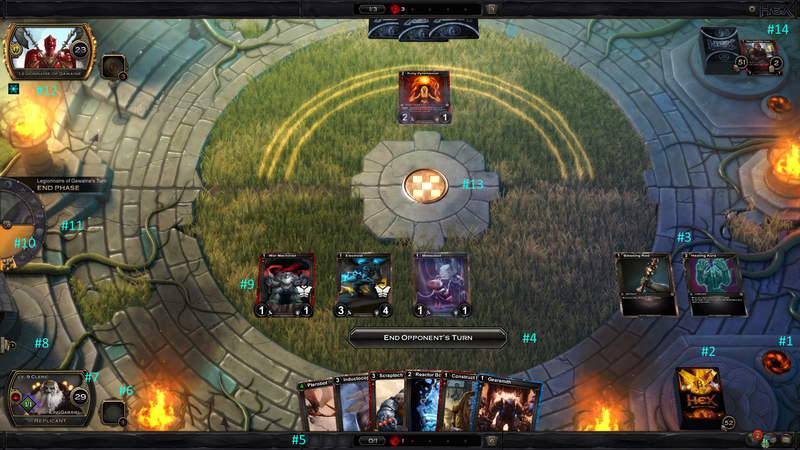 #9 Cards in play - The card with fog on cannot move this turn as it has just come into play. Cards with rocks on are tunneled and will pop when they reach the amount of tunneling counters the card states on them. #10 Gold indicator to show who’s priority it is. faster. The gear icon by it however enables/disables some of your phases. #12 Passive Power - This is tied to champions, and some passive powers will effect both champions and so show up on both. #13 This is where the chain occurs - any card/action/effect can be stopped or altered here by another, operating on first in last out) (E.G. Stopping a buff (card enhancement) with a removal card destroying the target that would have otherwise been buffed. When the chain isn't in use, this is just another phase indicator, which changes when the phase changes. This is where the coin flip lands too. #14 Crypt, with count in crypt - right click to show cards in here. 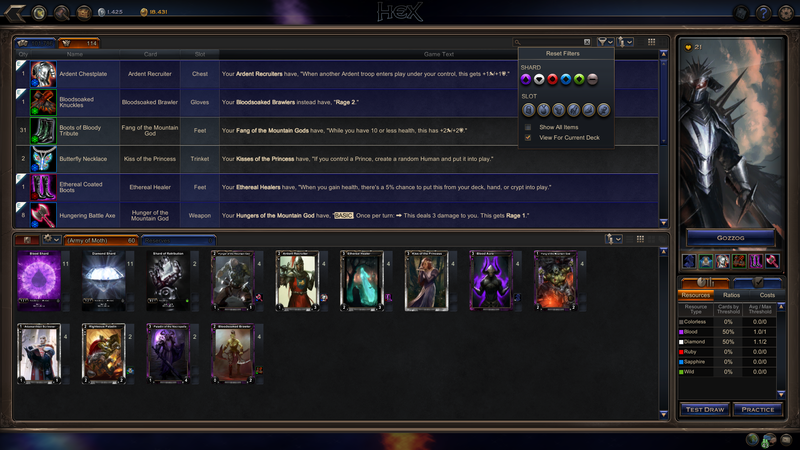 Hex has gems you can socket into certain cards. You may want to socket your cards if they have socketable Major or Minor. Click the gear icon to the left of your deck name or the floppy disk icon to save. You have all the gems from the start, and they don’t run out. You may only socket 4 of each kind in a deck. PvE classes have unique unlockable gems. effect to work. "On play" gems do not work if you play the card and then gain the threshold. Wondering what those icons are below? See the extended art section for more details. 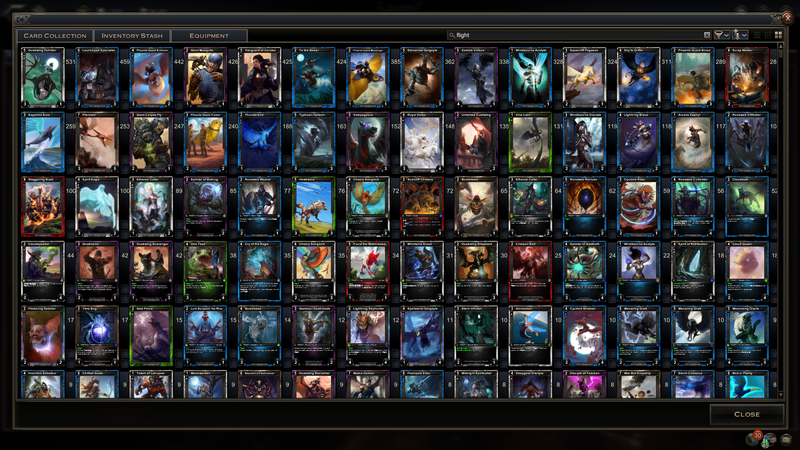 Also, it lacks reserves (15 cards you can slot in and out between constructed games). items shows you ALL the cards in the game, and can be very useful for searching for what you want to get next. see what you need for a playset. Bear in mind that orange rarity cards are AI only and that HXE sometimes adds promos that are soon to be but not yet in the game. Usually you want your deck to be the minimum required (60 cards) and on average 24 shards, depending on your curve. The maximum of a card type you can have is 4 apart from in limited formats (draft, sealed) where you can have as many as you want/get. Unique cards are not one per deck, neither are legendaries. Unique cards can only be one on the field per player and if you play a second the first one you played will die. The maximum deck card limit is around 300, but the only sensible reason to go that high is certain PvE talents or a card like Jank Bot. Which is hillarious, may I add. Smooth moves for a walking lighthouse. You can click the icons by the sort button (the one by your deck, not at the top) to swap views, allowing you to more easily see your curve. Clicking the gear icon by the deck name will let you save/load/rename etc. as well as select sleeves (goes on the back of your deck for your deck/cards, obtainable a few ways including some via frost arena). 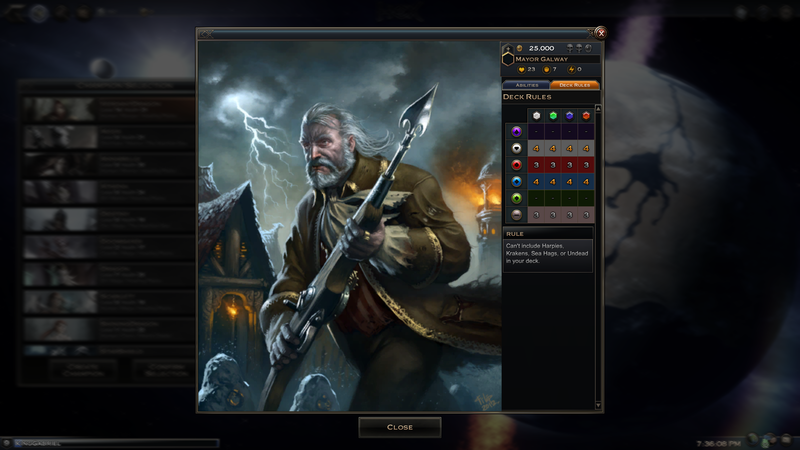 Battleboards (In-battle background) and Coins (for replacing coin flips) can also be swapped here. You can tick the checkbox by a sleeve/battleboard to make it your new default. 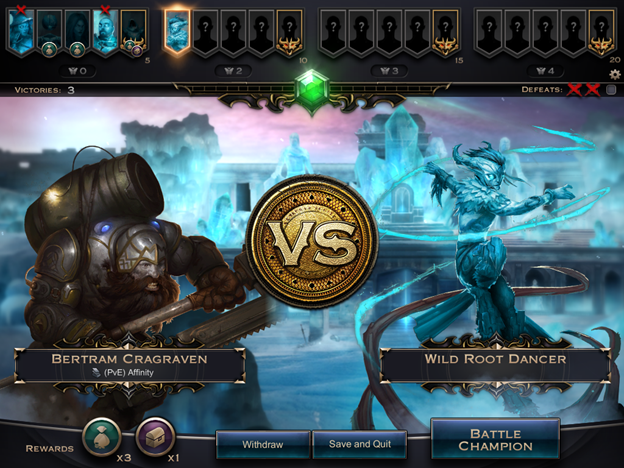 As of recently there is a separate tab for frost ring arena you need to click to see non-pvp cards in the card collection from the main menu. The Immortal format consists of every PvP set (no equipment), the standard format doesn't allow Shards of Fate or Shattered destiny cards (white top left hexagon on card where card cost is). Siege defense is similar to frost ring arena but with a different ban list. Siege attack uses the standard tab. The post was edited 5 times, last by KingGabriel ( Jun 29th 2017, 2:14am ). Campaign is here and the chapter 2 is out. Personally, I'm very excited for the next patch given how many mercenaries (essentially sub-classes) we got this time around) but lets see what choices we can make already. You have 12+ character slots, but choose wisely as the class/race you pick can vastly affect difficulty. 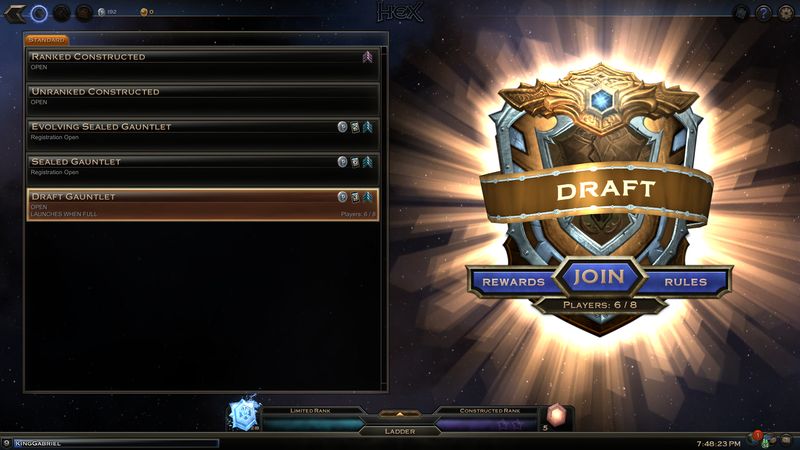 Note the heart and card icon below the talents showing starting health and cards in hand amount. Avoid - Vennen Mage, Human Cleric, Coyotle Warrior. You will have to clear a tutorial dungeon before you can edit your deck or talents. hex.tcgbrowser.com/talents/ is a good way to see what talents you can get with each class down the line. You can zoom in and out using the mouse wheel. Pay attention to the legend in the bottom right as it should help you not get lost. 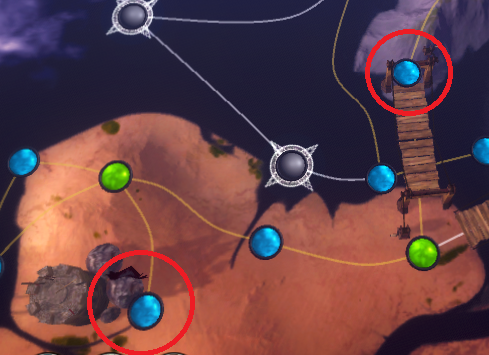 It's important to note that the black encounter in the river on the first island is optional and very difficult (Savage Lord then across the bridge is the main path). When in doubt, follow red flags or go back to towns to see if you've missed quests. Dungeons are repeatable for loot, map encounters are repeatable if you make a new character and each race has some exclusive rewards for running through that you can then use in any PvE mode. 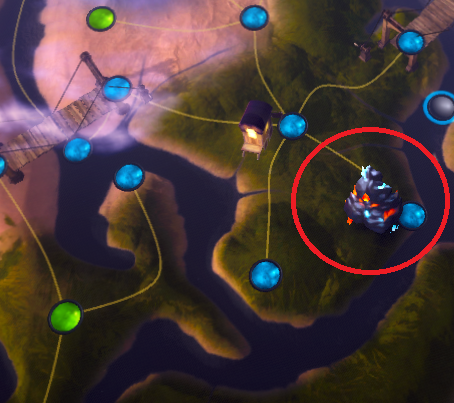 Frost Ring Arena was the first part of PvE content for Hex and a good way to start building up your collection f2p-wise. Click the icy button below where starter trials are/used to be to enter. 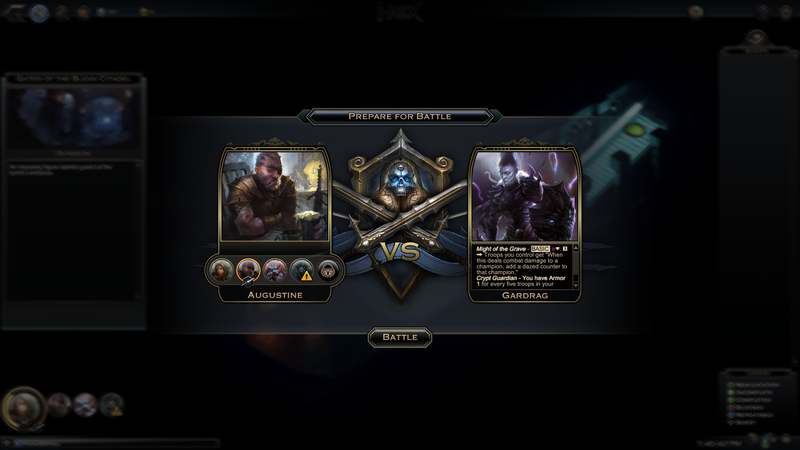 You can use both PvE (will have a crown icon at the top) and PvP cards in arena, but you can only use PvP cards in PvP. This is also true of PvE equipment. Unlike the screenshot below, you will not have the skip tier 1 button until you perfect the first tier. You will have three lives with which to fight through the arena, but you keep all your rewards up to that point if you lose them all. An important distinction for the Frost Ring Arena is that as well as there being random champions and challenges throughout, your opponent has a passive as well as an active charge power. The passive power can potentially affect both of you - hover over it if you are uncertain. 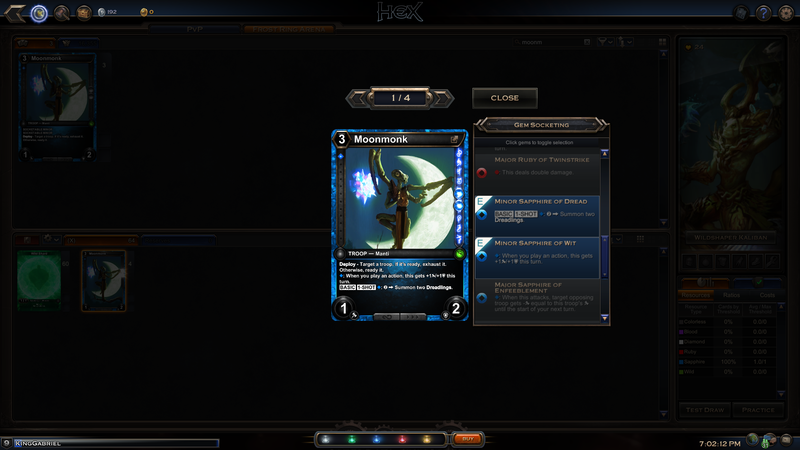 If you are unsure what a keyword on a card does, right-click on it. If a card transforms into something else, or can generate a secondary effect or card, you can click the bold text to see what it will transform into. When you are done playing, you can decide to either Withdraw, keeping what prizes you have earned and resetting arena progress, or Save and Quit to continue later. If you look in the lower left, you can see I have won 3 gold pouches off the opponents I fought and one piece of equipment or pve card from the boss. Gold pouches are worth a variable amount, with pouches from later tiers being worth more. A tiny amount, but I wasn’t exactly playing for long. You can hover over the equipment icon to see what card it affects and how it affects it. 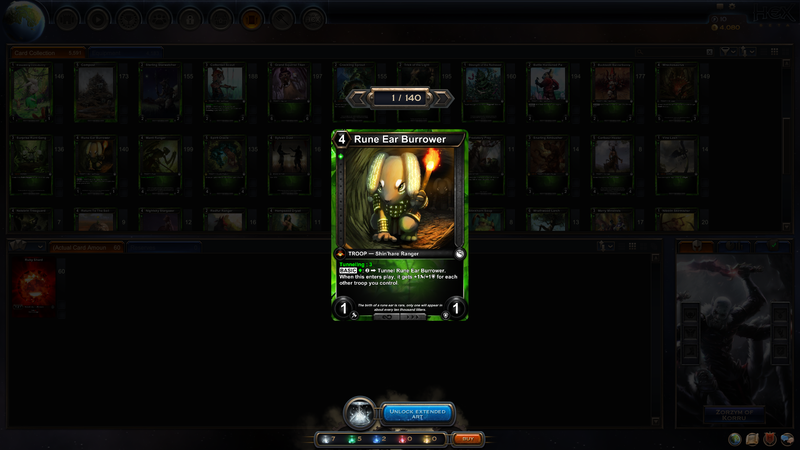 The equipment piece I got was common, and for a wild card (white text, green border). You also have the chance to get stardust from these chests: See: Extended Art section. First, either open your main collection or your campaign collection, then click the armor icon tab in the top left. Double clicking the equipment in the equipment tab will equip it to your champion and after saving its effect will be applied to the card next time you use it in PvE. You can search by equipment name or card name. As you can see here, I have searched for “Darkspire*” cards and clicked the filter icon so I can see which ones I don’t have, too. This can be a good way of finding what you need for your PvE deck, but weirdly the AH (Auction house) seems to search in a different way. A: The effect targets the field. B: The effect is permanent. That being said, the second adventure zone gives quite a decent amount of gold also and is accessible by about level 5 by going to the river next to the fortune teller at the desert crossroads after picking up a quest (at cave-in or ambling mesa). After completing the first dungeon in the second zone, getting to the town and then heading either two battles northeast or northwest, you get two pre-built decks with mercenary slots. A third slot is obtainable later on, and a fourth if you are a lv15 human. Account leveling also rewards these occasionally but you can find more on the auction house (the common ones are usually 1700g or so). Each of these gives you a swappable champion power and passive powers applying to your whole party. Mercenary powers affect other mercenaries, too. You can also customize a different deck for each slot to deal with weird encounter decks. Completing two mercenary challenges (helmet icon in dungeons) with a mercenary and paying 25k gold will upgrade a mercenary - hovering over the buttons will show you that increases the passive powers of this mercenary, but the actual change can vary - click the + icon to see the change. You cannot do this while the mercenary is in a deck. As you can see here there is the option to pick a mercenary to fight instead of your main character - or you could use your main character with just the passive powers of the mercenaries. The yellow ! means that the deck is invalid, but there are a few cases where this is just a visual glitch and you can click battle to use it anyway. The post was edited 1 time, last by KingGabriel ( Jun 29th 2017, 2:13am ). the mail. 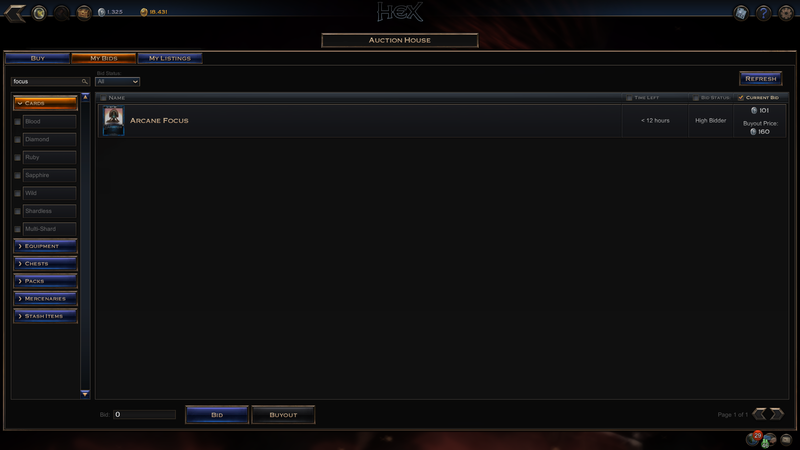 Gold is often traded for Platinum in trade chat. Examples are shown below. ●	- Subsections that sort into equipment type. those cards, so make sure to follow those steps. will also bring up the corresponding equipment, which you can hover over to see its name, slot and what it does. PvE cards also have a numbered instead of symbol set icon. the highest bidder or have been outbid, and the current bid on this - it is very easy to rebid from this screen if I get outbid. and they work in much the same way. If you want to add a new card to list, click the + Add button. 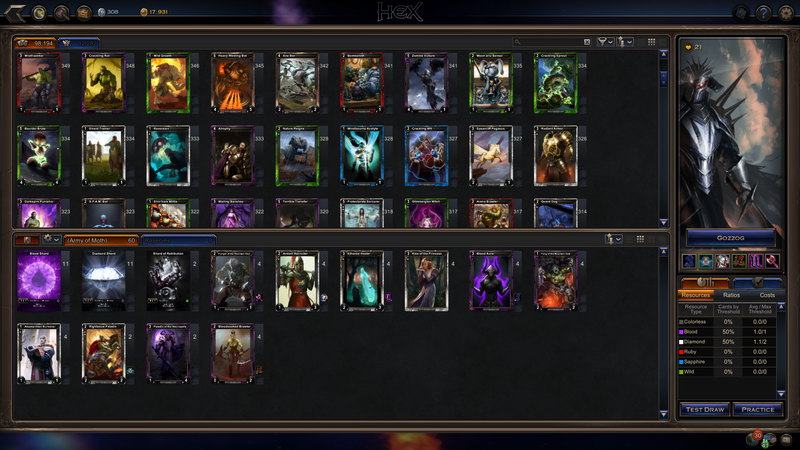 This has much the same UI as the deck manager, apart from that it doesn't show cards you can't list (e.g. starter deck cards, shards). You can click the equipment tab to list equipment, or the inventory stash button here to list packs or items etc. end up at the last page, regardless of what filter you set. The post was edited 1 time, last by KingGabriel ( Jun 29th 2017, 2:11am ). Click Rewards to see what you can win, and Rules to see what type of tournament this is. 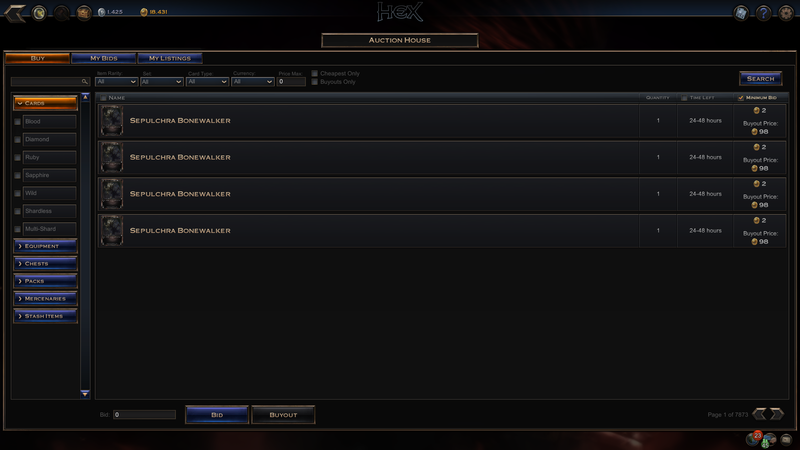 Hover over Icons to show cost and whether it is ranked or unranked. 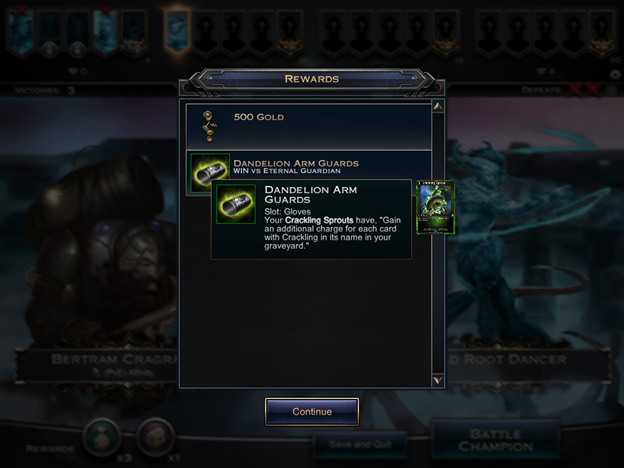 Evolving Gauntlet: 2 Doombringer Packs, 100 Platinum. Max 5 wins, max 3 losses before it ends. 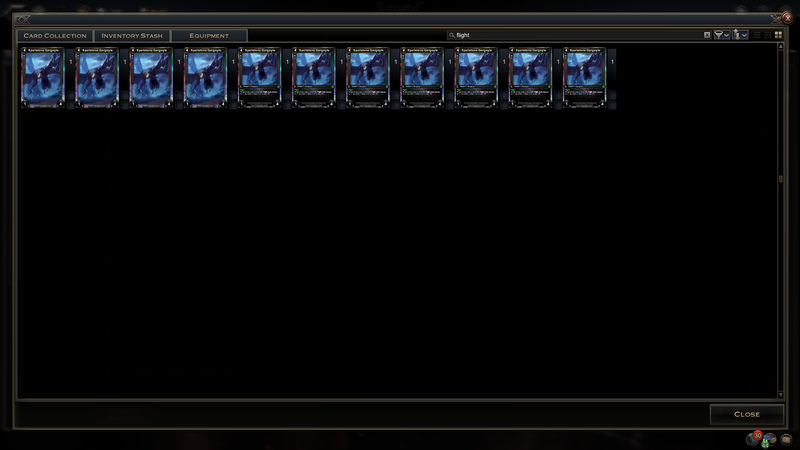 Un/Ranked Constructed: Free. Ladder rewards cycle every 2 months but you keep them when it does. Draft Gauntlet: Pick 51 cards from yours and your opponents packs, ordered in rarity left to right with left being the rarest card of the pack. (you keep what you’ve picked permanently) , single elimination. 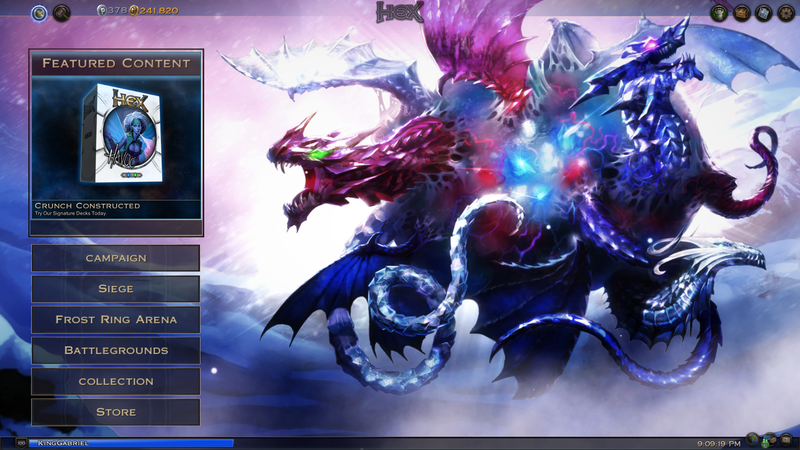 3 FrostHeart Packs + 100 Platinum entry. 3 matches, 2 match losses and you're out. Merry Melee: 100 Platinum. Max 5 wins, max 3 losses before it ends. exit icon with an arrow pointing north-east. This will only display it with text, it does not remove the EA effect permanently. You may be wondering what siege is on the main screen - is it something pvp? pve? Well, it's actually both in a way. It's a new game mode where you fight or design an AI gauntlet for currency. The in-game details when clicking view rules inside the game mode mostly covers everything (I'd suggest reading those), but there's a few bits and pieces extra you might want to know. Decks made for defense should be made using the siege defense (PVP+PVE+equipment) tab which auto-sorts to what is useable for defense. 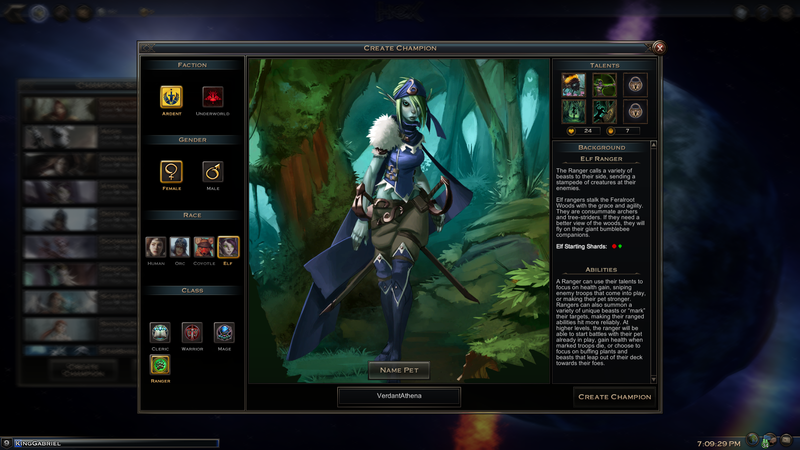 Click the blue icon above the champion selection on this screen to select AI personality type - feel free to experiment swapping between to see what works best. You can click the practice button to duel against your own siege deck for further testing. 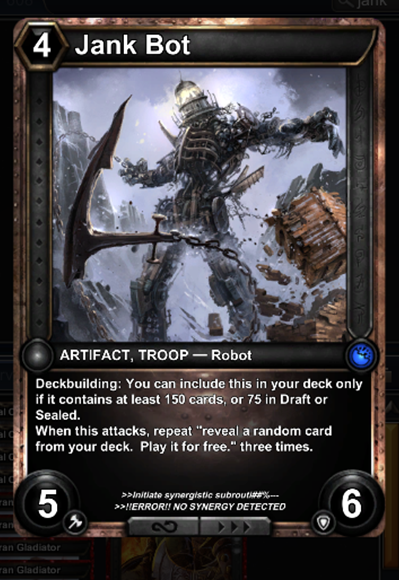 Decks made for attack are standard format (see: hextcg.com/set-and-gem-rotation). You can sort the categories ascending or descending by clicking the tabs such as cost to attack. The free sieges are developer made sieges just for fun, but people have been known to set sieges at minimum stake just to have attackers play through a fun design also. You might think that losing to a siege means you should avoid it. However, now that you know what your opponent is running you might want to attempt revenge to try and reclaim what you've lost. 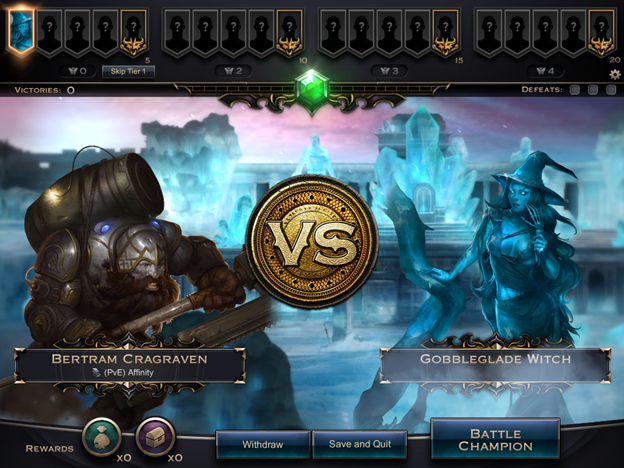 Opponents can see the battleboards and sleeves you select. 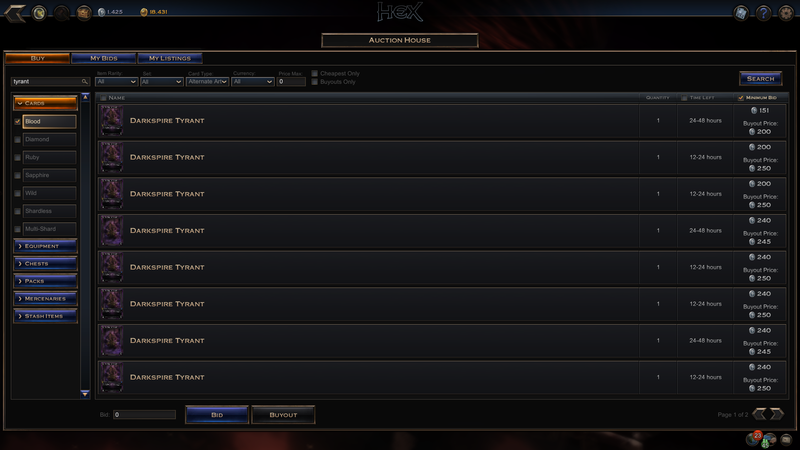 Taunts (text box icon) must be refreshed when you lose and the decks must be re-selected. You can withdraw and gain the remaining bounty back but if you do this while being battled you will auto-lose those battles. You can sort categories ascending/descending by clicking on the tabs. When in this mode, delays the player makes are shown in battle chat - quick mode removes most delays from the replay. You can exit at any time by clicking the back button on the very top left of the screen. All delays are wiped after you start a new defense. 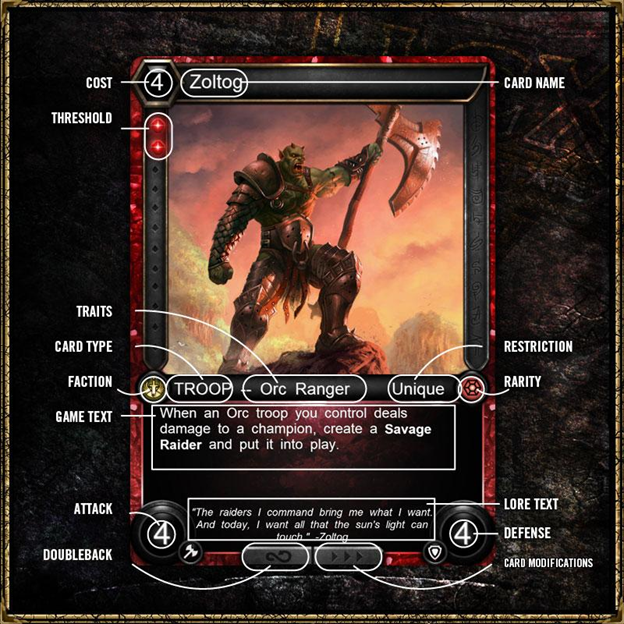 Main thing to remember is that most cards when right-clicked will pop up with a tool-tip of what their keyword does. ●	Black: Generated by card effect only. Unobtainable. 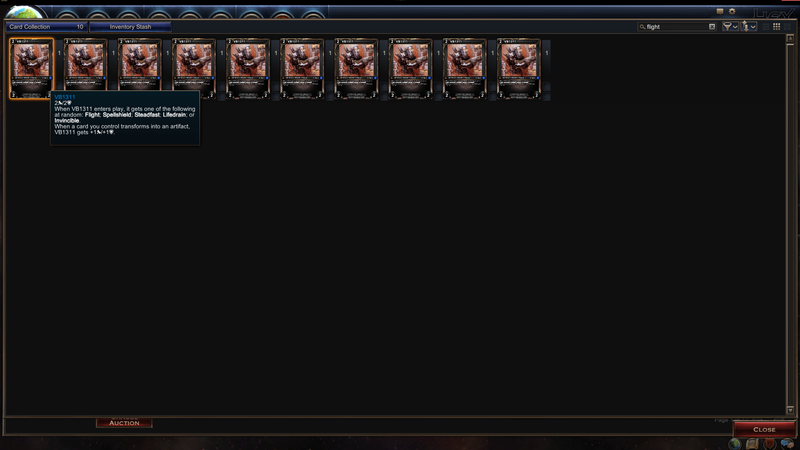 Shard - Cards with “shard” in the name - you have 200 of each of the base ones to start off with. Resource - [L1][R1] L - resources you can use this turn R - resources you can use next turn. Threshold - Top left of cards, required to activate gems. 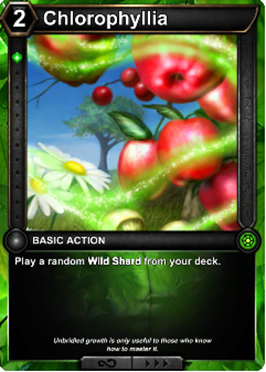 Ramp - Increasing your resources, using cards such as Chlorophyllia to gain more than one resource per turn. Basic - Can only be used on your first and second main phase, and not in response to cards. Quick - Can be used on your turn or your opponent’s and to respond to cards if you choose. The post was edited 4 times, last by KingGabriel ( Nov 18th 2017, 8:28am ). Asking for help in chat and common rarity cards in chat is fine, but try and keep most requests to help chat if nobles are on. Nobles are Hex Staff and chat moderators. They have the prefix NOBLE in front of their name, and usually answers questions in help channel. If you need to talk to them in private, feel free to use /t name msg to whisper them. 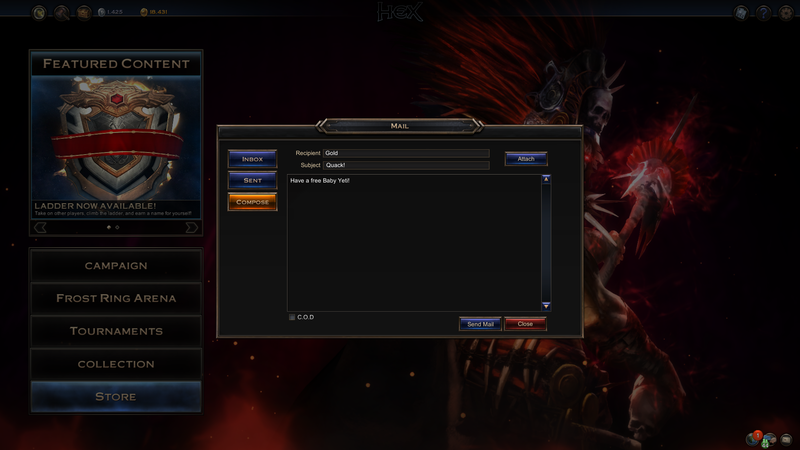 You can see a full list of chat commands by typing /? in chat then hitting enter. 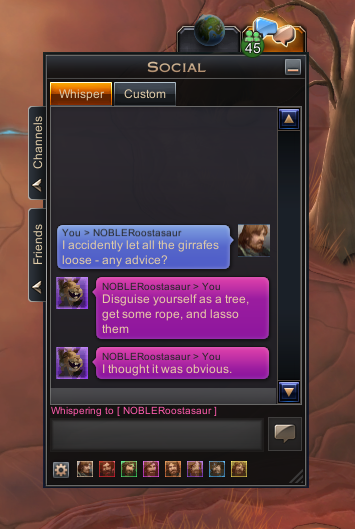 Note: Nobles usually have orange chat boxes, unless you whisper them. Note if you cannot access the Auction House you usually need to proceed further in campaign first although people will be able to mail you cards in the meantime. If cards aren't listed in gold, use the C.O.D box as in the auction house section to trade between gold in plat in trade chat. They have to pay the amount set there to claim your gold sending mail. 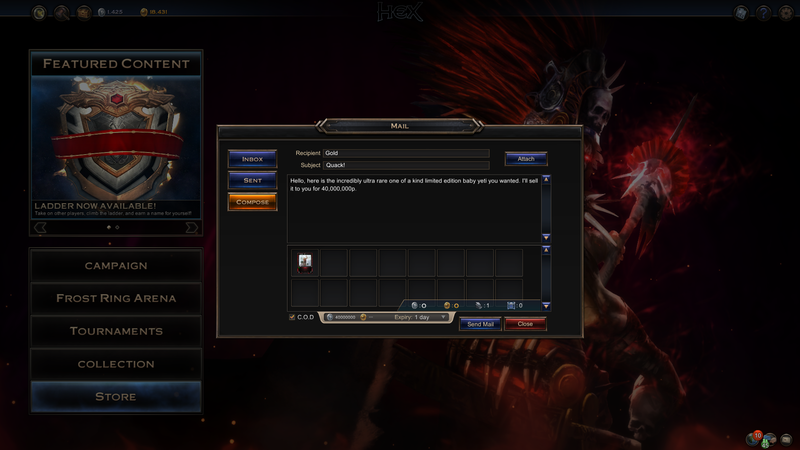 If you are unsure of current gold rate, usually asking in chat or observing trade chat should give you a clear rate, but there isn't much harm in trying to haggle a better deal. VIP Tournaments are 4 best of 3 Swiss and occur the last full weekend of every month. They alternate between constructed (VIP ticket + 500p) and sealed (VIP ticket + 1600p - 200p per pack)Jul 29th - 31st: SealedAug 26th - 28th: ConstructedSep 23rd - 25th: Sealedetc. 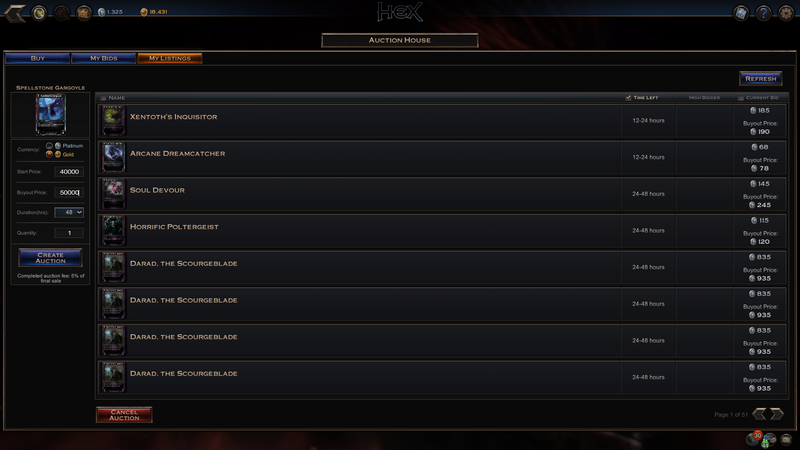 hextcg.com/terms-of-service-psa/ < link explaining real world trading stance. The post was edited 1 time, last by KingGabriel ( Mar 17th 2017, 11:03am ). Q: Arena froze? What do I do? A: Hit spacebar a few times. Try pressing F8 to skip past blocking phase, F10 to end your turn. Bare in mind you can re-launch your client and login again quickly and keep your place. Conceding is also an option, as you have three lives. Alt-tabbing will undo F8 and F10. Q: I encountered a bug! Where can I report it? Q: I have a problem that needs reimbursement! Where do I go? 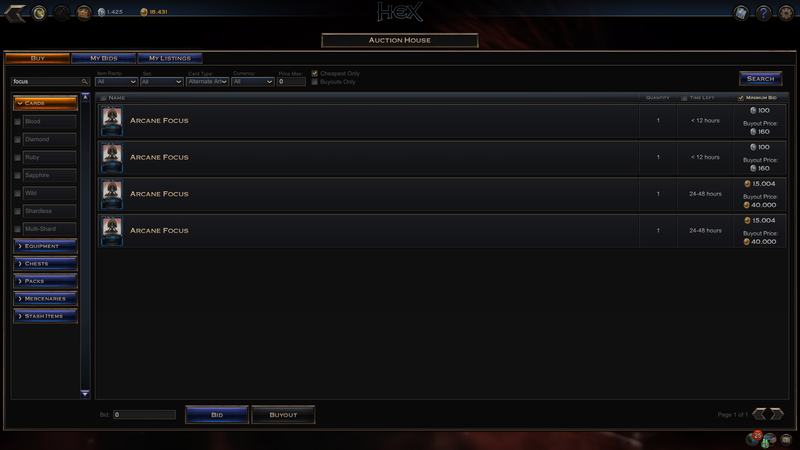 A: support.hextcg.com/ Do not use hex support to report bugs. You will need to make a new account. Q: Are any cards locked to the race I chose at the start? Q: The game isn't in my language? What can I do? Q: How do I see my doubleback? A: Not currently in yet. Q: I see people with another battleboard! How do I get it??! A: Store, Chark Mart has a rotating one every month for 1000p you keep. As of time of writing it's the forest board. Some can also be won in tournaments. Q: When can I open chests? A: You can right now! You might need to drag slightly above the pool to open them though. Q: An image is messed up, what do I do? A: When you have time, relaunch and click repair install. This can solve a variety of issues. Q: Do I get refunded when I get outbid? A: Yes, although as with any AH purchase/sale there may be a couple seconds delay. When in doubt over items, relaunch and relogin. Q: Will this game have disenchanting so I can get rid of scrap cards? A: Yes, this is a planned feature. A: Yes, put a ticket into hex support under misc. You can see if a name is taken by doing /friend name. If it says they do not exist, the name isn’t taken. Then, paste it into an image editor and save. This may be required for reporting bugs into hex support for item reimbursement purposes. 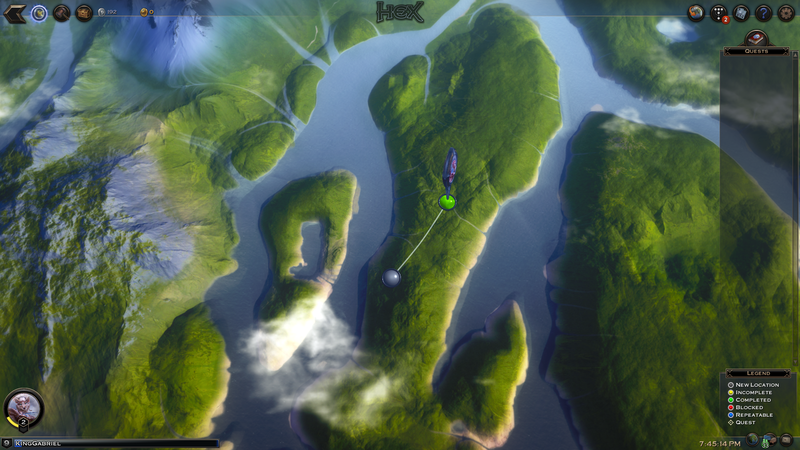 Screenshots may not work if you are playing in fullscreen mode (Can be toggled from settings). Q: Why do some people in chat have orange text? A: They are HexEnt employees. Q: How do I talk to my opponent in-game? Q: A Dragon is after my gold horde! What do I do? A: I'll happily keep any gold safe from dragons. No refunds, mind. Q: I want your signature! Gimme! Shift+Click: Link card you possess in collection or can see on the board/in your hand (etc.) 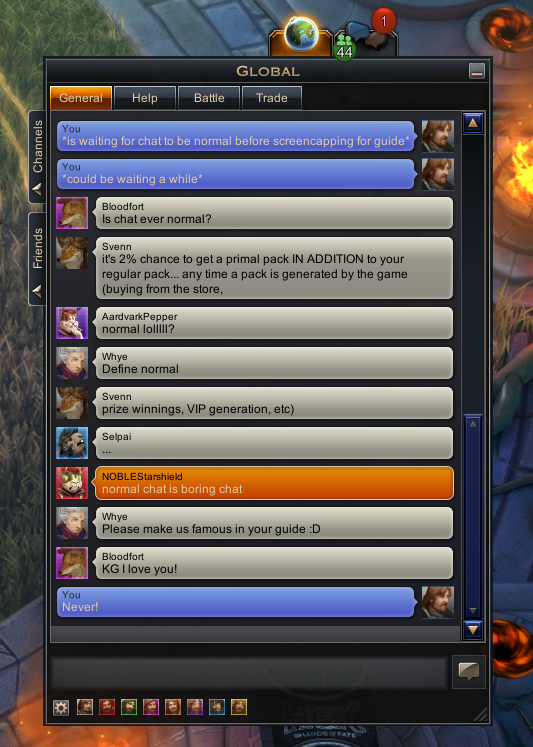 in-game into chat as a clickable link. /friend username: Sends a friend request to target user. Can also be used to check if a username is taken; if not it will say “X doesn’t exist”. [ARROWR] - typing this as arrowr in card collection shows all cards with the >, which can be useful for finding payment power cards. Good article on when to mulligan and probability of drawing certain kinds of hands. The post was edited 3 times, last by KingGabriel ( Oct 19th 2017, 2:41pm ). Bearing in mind I'll be updating this with set 8 and other future major content patches when they hit, feedback is welcome/appreciated. You don't need to explain the user interface because new players can hover their mouse over buttons and icons and read the descriptions themselves. As Martin LeBlanc‏ said, "A user interface is like a joke. If you have to explain it, it’s not that good." I'm afraid I cannot recommend this guide. 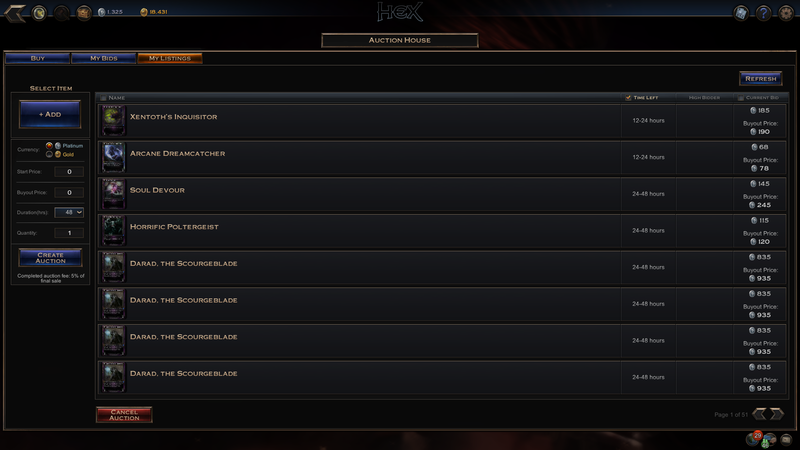 @Arkansaw Check the Spending $$$ for HEX guide on a few tips about Gold spending. Also GMG is the best place for raw gold farming, no question. Best Gold:Time_Spend rate. Slight issue with updating the guide - the UI is presently having scaling issues - should I wait til those are fixed, or put up a disclaimer and update the screenshots etc? I mean, in theory people should be able to understand the new UI with the current screenshots already but I'm a bit unsure on it. Thoughts? Sincerely, I like the new big font. It was weird at first but now everything is much easier to read. I'd like if they kept it. I would wait bit to see if they kep ti or change it and then update screenshot appropiately. I hope they add a scale setting later on, as personally I like things super tiny.